A substantial house with balcony and portico set in a garden, with Indian attendants and a syce and horse waiting. bl.uk > Online Gallery Home	> Online exhibitions	> Asia, Pacific and Africa Collections	> A substantial house with balcony and portico set in a garden, with Indian attendants and a syce and horse waiting. 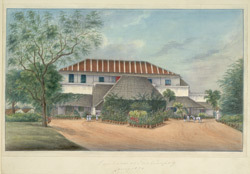 Watercolour of a house in Tiruchirapalli in Tamil Nadu, by an anonymous artist working in the Trichinopoly style, c. 1870. Inscribed in pencil on the mount: 'Our house in Trichinopoly Janry 1870'. Much of the present town of Tiruchirapalli dates to the 18th and 19th centuries, when the British constructed the cantonment, many civic buildings and churches. The house shown in this drawing was constructed in 1870 and has a balcony and portico set in a garden. Indian attendants and a horse are seen waiting.